A recent "review" of ANGEL: SMILE TIME gave it a rough score based simply on the fact that the reviewer didn't see the need for an adaptation of a beloved ANGEL episode that tells the story of Angel-as-puppet, a tale we've sequelized in comic form. Fair enough (his sentiment, if not the review itself, which you'll have to seek out if you want it, no easy links here for that one), but then again, many people like this kind of thing--we did it based on requests for it in the first place. In fact, enough people liked it that issue 1 is now a complete sell-out, a testament both to fans knowing what they want and also to the great job Scott Tipton and David Messina did in adaptating the episode. As such, here's a two-page spread from issue 2, in stores on February 18. Well, I don't know of too many comics that are adaptations of TV episodes... so maybe that reviewer was just afraid of change. 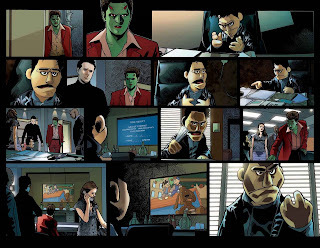 Messina captures the characters very nicely. I'll be buying this, as I have all the other Angel books. I especially like the new scene from #1 that Tipton and Messina whipped up. That was a nice surprise. This is now my new wallpaper at work. Great job, guys!